This topic contains 45 replies, has 14 voices, and was last updated by reuptake 1 year ago. Showing off – The best strategies and portfolios. Use external url to post screenshots. My first month of subscription to QT is nearing its end and to be honest, I’m considering quitting it and staying with just signals subscription. The reason is I haven’t find any idea for strategy I can test and then use. I tried creating “meta strategy” from 5 strategies which now have 20% allocation each, but improvement of results just wasn’t there (in extreme cases there was “better” Sharpe, but strategy had very different risk profile from the original one. The most obvious use would be creating some strategies for my local market (I’m based in Poland). The thing is we don’t have good bond ETF equivalents to be counterpart of stocks. But even trying to create Nasdaq100 strategy equivalent is very difficult since I’d have to apply the volume filter to sort out stocks with liquidity problems. I don’t know if that’s possible using QT? So maybe someone here has some unexplored (or explored) ideas of strategies? Something with commodities? Silver? Or, let’s go exotic: bitcoin? Yes, we also hope that little by little we can create an exchange of strategies, portfolios and further ideas here. To start-off and keep you motivated, how do you like this one? 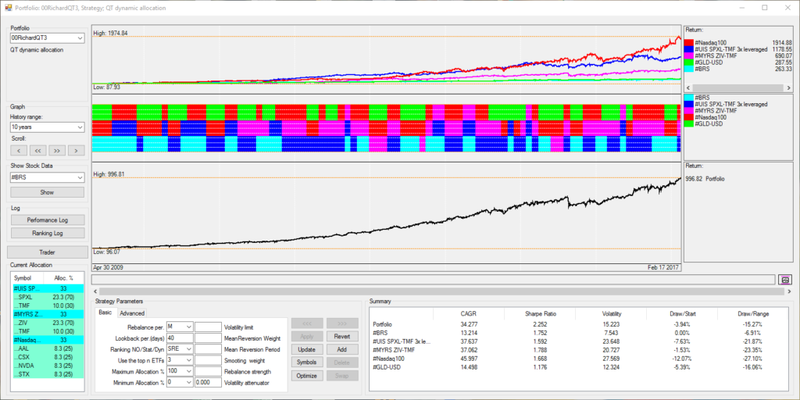 This is the EPP strategy (Enhanced Permanent Portfolio) with the QuantTrader.ini file attached. It is composed by a gold and a equity sub-strategy. The equity sub strategy is composed by a DOW30/Nasdaq100 strategy, a world country strategy and a Eurostoxx 600 sector strategy. 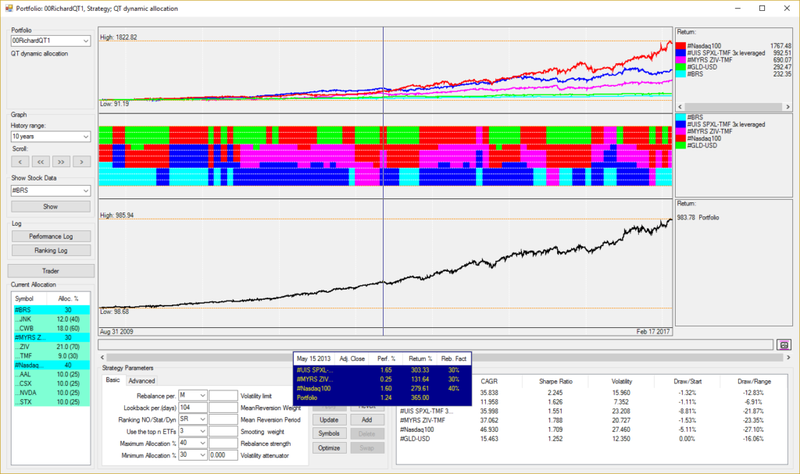 Simply download the QuantTrader.ini file and put it together with the QuantTrader.exe into a new folder. Then on startup it will load the necessary symbols. Why did you choose the StoXX over Global Sector rotation out of curiosity? In all honesty I am having a bit of a problem with TMF as a hedge. I know we had a chat about it the other day, but seeing how it behaved today when the result from the election came in I would say perhaps (and I don’t know yet) my concerns that when you have two very expensive products the inverse relationship is much harder to explore and today it was gold that reacted the best to the situation. Perhaps a sub strategy with Gold, shorter bonds etc might be worth exploring. Ok so I have been playing around with a currency alternative to the ZIV-TMF. I like the original set up but I am concerned that the inverse relationship might be temporarily suspect. I used Yen and UUP as the hedge to ZIV: I have no way of testing ZIV further than 2011. Alex or Frank do you guys have a formula for that? leveraged version x2 uup and x2 FXY a good sharpe for this product at 1.9 and 35 Cagr I also used the unleveraged version which has a 1.7 Sharpe and 29 CAGR Perhaps a more sensible choice. Please critique it so I can learn! 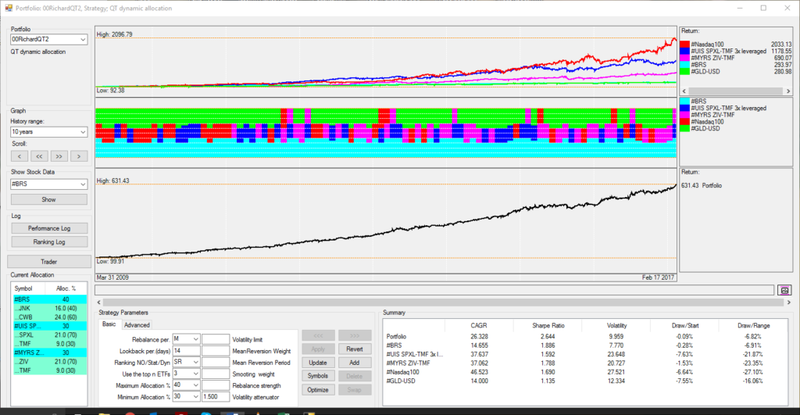 Going to reply to myself and say that as I started using the optimizer tool on ZIV-UUP-FXY or FXF etc I noticed that I get a very small area with light grey and white and rest of it very dark or black IE not much room for error and as its only over 5 years I would say its too risky. Instead I have included the symbol ZIV as a standalone in the Meta strategy as a diversifier with good effect. Simply download into a csv file and match the file name of the symbol in the QT folder. Once you update history from Yahoo, obviously these are gone. These are synthetically calculated and match quite nicely in the period when real data is available. Still take these with a grain of salt..
sounds like a great idea to me! We had some seminars on other topics back in 2015, but never could get big enough of an audience, but let´s try again. Let me send an email to the user community to see interest, then we can discuss topics to be covered and dates here in the forum. There has been quite an exchange with several guys over the last weeks, but sadly mostly over Skype without recordings – but the “crowd power” is growing. We can also do a 1:1 walkthrough first to get you started, just pick either Switzerland, Greece or Mexico and one of us is there for you. 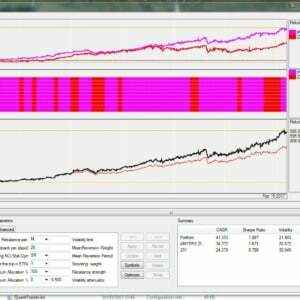 Had a good exchange with Richard over how to replicate a portfolio from our Portfolio Builder in QuantTrader, versus using the dynamic allocations in different algos. Here some of the ideas, guess this will develop into a longer post with your support. Here the mayor difference between PB and QT: PB uses a “fixed weight allocation”, that is you always stay invested in the same fixed allocation. In the MAX CAGR Vola <7% example this would be 5 strategies with the fixed BRS 25%, 3xUIS 5%,MYRS 15%, NASDAQ 25% and GLD/USD 30% – and all ETF the strategies are invested at each point in time. 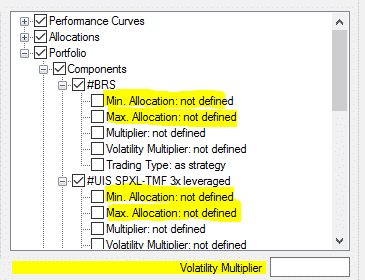 In QT you can also do this (example below), but the way we use it to pick the “Top N” best performing strategies in each period and let the allocations between them be optimized. This is the “meta-strategy” algorithm we talked about. 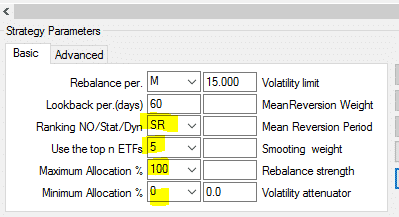 For the PB version I fix the allocations by using the min / max allocations by each underlying strategy, and then use SR ranking algorithm with Top 5 Strategies, so QT cannot modify allocations or pick less than 5 strategies. No need to limit volatility, it is 10% over the whole period, only if you choose very short lookback period then one time there is a peak. Very nice results, but note that the backtest is starting 2011 even if I use 10years window – ZIV data for MYRS is limiting us. Can do a test with synthetic ZIV data later. For the QT version, I remove the fixed allocations again, and chose different ranking algorithms, so you see the difference. 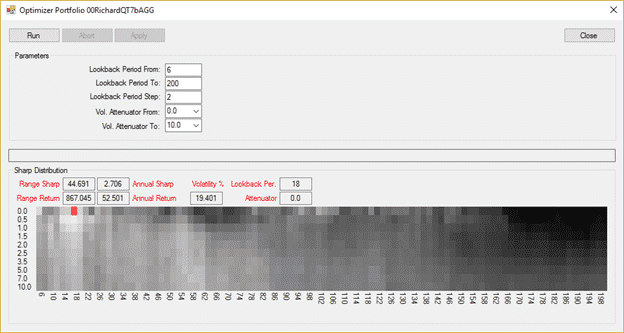 All of them slightly optimized for lookback and volatility attenuator and limiting volatility to the 15% you used. 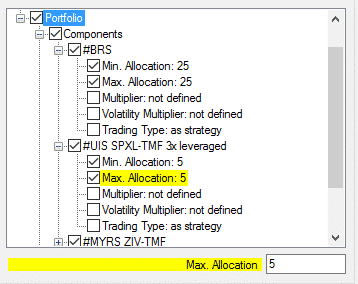 Static Ranking with Top 3 Strategies, min allocation 30%, max allocation 40%. Similar to last post: Look for the Top3 performing strategies in the last 104 days (5 months), and allocate 40/30/30% to them. 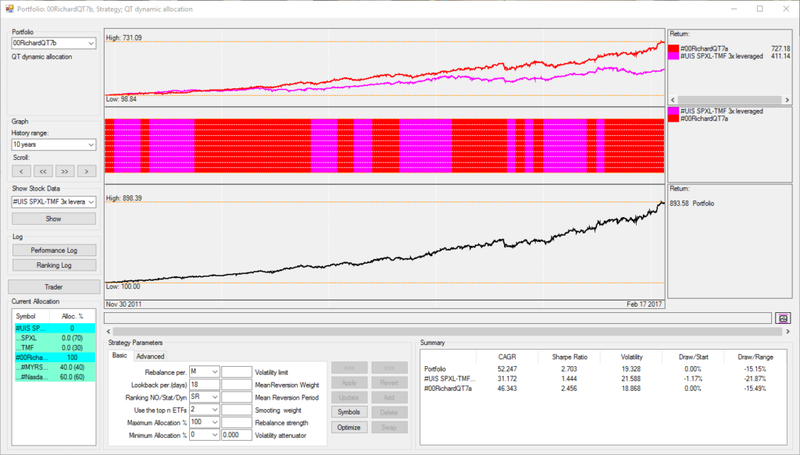 Version QT2: With a shorter lookback (more responsive) and a higher volatility attenuator (more weight on volatility SR = R / Volatility^VAttenuator) I get close to the fixed weight model, but only invest in Top3 strategies. QT3: Now let´s try SRE = Static ranking, equal weight = with Top3 each one gets 1/3. Here I do not need min/max allocation limits. Optimized lookback is slightly longer with 40 days or about 2 months. Look for the combination of risky assets that has highest modified sharpe each period, and built an equity line from these. 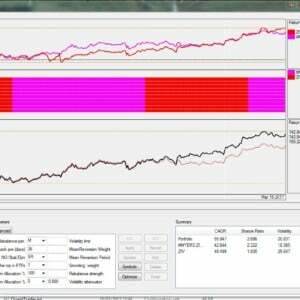 Take this equity line and optimize it now for modified sharpe together with the hedge. Hedge (here Gold-USD) is always invested as it is not “competing” with the risky assets, and allocated to the degree which is needed to maximize the modified sharpe. Results are not spectacular, but it´s to show how this works, you see the change to the others. Version QT5: Now I use DRE = Dynamic Ranking Equal Allocation. So first equal allocation between the Top2 and then we add the hedge (GLD/USD). Basically no change in this example, just to explain the algo. And here, QT6, with SRRP= Static Ranking Risk Parity. The Risk Parity algo is different, as it tries to find an allocation where each asset contributes the same amount of risk (=volatility). Quite popular in big funds and a lot of hype recently as these funds experience big shifts when the volatility regime or correlations shift suddenly – as it has been the case last year(s). Then they basically move the whole market with their re-allocation. You also see that below: Normally allocations “flow” softly across the month, but then some volatility comes and BRS (light blue) moves in. Nice algo, I like this stuff fundamentally. DRRP is the same, but again we first run risky assets and then add the hedge. Finally, just to show off a bit: QT7 a Strategy of Strategies of Strategies!! QT7b takes this block and adds 3xUIS. QT7b Aggressive version 52% CAGR with Sharpe 2.7 and DD of “only” 15%. QT7b more conservative with a 12% volatility limit to step out of market in volatile times. Note that due to the 3x leverage and ZIV the overall volatility is still 17%. And here another by-product QT7bAggb, Nasdaq 100 hedged + MYRS. Try using the hedged Nasdaq in yours, instead of “normal” Nasdaq. Here a zip file with QT311S and the ini files containing above strategies. After downloading change extension from *.doc to *.zip, put into a new folder, download assets… and enjoy! For someone not the sharpest in maths I found the post to be very troubling . Would you like to respond to their comments regarding the results of GMR and how it tanked, curve fitting etc ? Tarantino, I have never used LI. It’s an obvious curve fit. It has been entertaining to monitor though. They publish charts that show when they went live which is commendable because it shows that the systems are actually not working. That makes me think that they don’t really appreciate the problems of over optimization. Just an opinion of course. This is a strange post. We know the author quite well. It is true that GMRS was the worst performing strategy for some time, but this did not begin when it went live and it also has noting to do with curve fitting. It began when the US market reached a all time high about May 2015. From this moment the US market went sideways with some quite big corrections. The mediocre performance is easy to explain. Since May 2015 it looked as if the US market has reached it’s all time height and investors rotated in other foreign markets. However these rotations have been several times only of short duration and the US market always recovered. This resulted in the realization of losses for several market rotations. It is just a fact that trend following strategies don’t like periods where there is no trend and markets go sideways up and down. The second reason for the lower performance is that we had some very big currency spikes and drops. If the US$ goes up against foreign currencies then foreign ETFs will lose about the amount the US$ goes up. We had several 6-8% US$ jumps up and down. These jumps have been stronger than any market trend and made investments in foreign markets very difficult. The bad thing was, that this huge additional volatility was totally unpredictable because it was the mere result of small wording differences in the minutes of our central bank leaders. All together every strategy can have difficulties for some periods. This is just normal. GMRS is 15% up since we started live trading about 3 1/2 years ago. Europe made about 10% during the same time frame. So, for US investors this is probably a mediocre result. For European investors however the result is quite good. Thanks for the reply Frank, yeah I thought it would be a bit strange you guys suggesting people check out that blog when it was quite critical ! Thanks for the strategies. I’ve been playing with QT a bit trying to get some good results, but I love 00RichardQT6 the SRRP strategy better than anything I’ve come up with so far. It would be great to see how it back-tests through the 2009 fiasco, that’s the real stress test for any of these strategies. I am short on time in between flights but Alexander has been bullying me a bit lately to post my thoughts on a possible improvement to the MYRS strategy. I should add a disclaimer and saying that I use QT to balance out less riskier assets in my vanilla portfolio so this may not suit all…However in my uninformed opinion I believe that this improvement has potential to reduce risk. It certainly has had no negative effect on the drawdown and Sharp is up. In essence you set it up as a small meta block. Each 14 days it will choose between MYRS and ZIV only. Basically the trend and momentum will decide whether to hedge or not. The first screen shot shows how precisely it avoided the Bond pull back around the Trump election it covers the last 12 months. That was a pretty period but going back 5 and more years it seems to stick see attached. Now remember that my own overall assets have several other hedges and non correlating assets which is what motivated me to set this one up.